Before we move away from the story of the course, two incidents should be recorded. 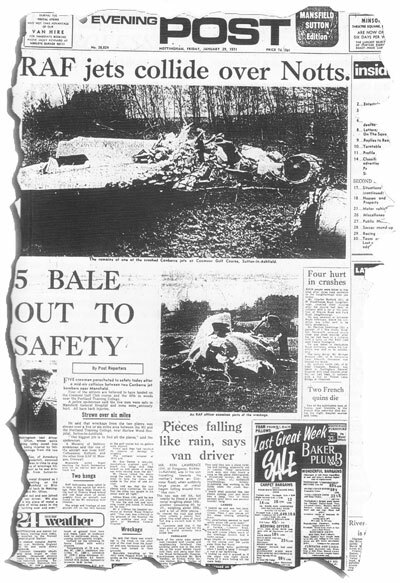 Coxmoor can claim a unique record, certainly for this part of the world, of being the scene of two air crashes - one which ended in tragedy, the other in miraculous escape. The first came more than 50 years ago, during the dark days of the Second World War. On a foggy morning in 1941, a Blenheim bomber came roaring over the course, the pilot almost certainly disorientated by the poor visibility. Perhaps not aware that he was flying over the highest point between here and the Ural mountains of Russia, the pilot was too low when he passed over Coxmoor, heading west, and he ripped into overhead cables which wrapped around his propeller, forcing the engine to lose power. Bill White recalls the incident quite clearly. "He must have come over the seventh tee and straight down the hole because we could see where, just in front of the green, his props had cut grooves, before coming to rest on the green. "One can imagine it was like running into a brick wall when the plane hit the bank at the rear of the green. Sadly the pilot who, by a strange quirk of fate, was named Mansfield, did not survive. But because the plane was new and was, apparently, being ferried to an airfield, presumably to be prepared for frontline service, he was the only person on board. Imagine the surprise of member Jim Horsley, who was playing on that fateful morning, when he walked through the mist towards the seventh green and came across the wrecked aircraft. There was also, during the war, a forced landing by another RAF plane. Bill White says: "I understand, but did not see it, that a Lysander - one of those high wing monoplanes they used to land agents behind enemy lines - came down on the 16th fairway and, after some minor adjustments, safely took off again. `This was in spite of the fact that Coxmoor had been compelled to produce speed humps across all fairways ... to prevent German invasion forces landing!" There is still a long low earth mound in the rough half way down the 1st (right half of the 14th in the '40s) which was put in as an aircraft trap. The second major incident involving aircraft occurred on a day in January 1971 when the clubhouse, golf course, players and residents of the surrounding area had something of a miraculous escape. Two RAF Canberra jet bombers collided in the sky above Coxmoor at around 10,000 feet and at a speed of 300mph. The impact sent wreckage showering over an area of around six square miles, like confetti in the wind. Much of it landed across Coxmoor golf course. One of the stricken jets came down on the 16th fairway, the other in a field opposite. Bill Drury and some of his staff were working on the fourth hole as the collision occurred and they were forced to dive for shelter in a bunker to avoid lumps of metal which came crashing down from above. The incident made headline news around the country and a security cordon was thrown around the golf course as Ministry of Defence experts were flown in by helicopter to begin an investigation and search for classified, top secret equipment which, the media was informed, had been carried on the planes. Five airmen baled out, four landing on the course, the other in woods near Harlow Wood Hospital. All were taken to Harlow Wood Hospital with back injuries, although none were seriously hurt. However, it quickly emerged that the towns of Sutton, Kirkby and Mansfield had had a remarkable escape. One of the pilots, Flying Officer Douglas Irwin was interviewed by a reporter from the Nottingham Evening Post while still lying in his Mansfield hospital bed. He told the newsman: "It was just plain luck that we did not land in a built-up area. "We did not have time to point the planes at the countryside and pick our spot." Crowds of curious local people defied the restrictions on access to get a glimpse of the stricken planes and local police chief Superintendent John A. Weselby broadcast an appeal to anyone who found a piece of the wreckage to hand it over to the authorities. While the investigation was continuing on the ground, Coxmoor was closed to everyone and secretary William Arbon was told that play could not begin again until the Ministry of Defence officials had finished their work and given the all-clear. As a footnote to those amazing incidents, it is perhaps worth recording that on a summer's evening two hot air balloons came down on the course near the entrance gate and on another memorable evening, but perhaps hair-raising occasion for those who were playing, an advertising airship flew straight up the course, barely clearing the clubhouse roof on its passage.